Wawa Welcome America rolls into town this week with more than 50 free events from Thursday through Independence Day, capped by fireworks celebrations at the Delaware River waterfront and Benjamin Franklin Parkway. Boyz II Men and Mary J. Blige are great, but if you want to start the week right, you can grab a free hoagie Thursday afternoon as Wawa celebrates the 25th annual Hoagie Day. From noon-2 p.m. at the lawn of the Independence Visitor Center and National Constitution Center, Wawa will be giving away more than five tons of free hoagies. The event is dedicated to honoring American troops and building on Wawa's partnership with the USO, whose Show Troupe will make a special appearance. 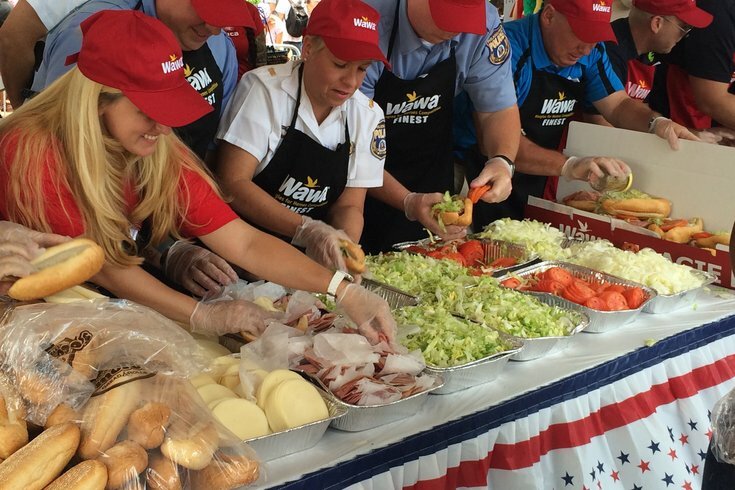 In keeping with this year's theme, "Everyone is a History Maker," the annual Hoagies for Heroes contest will bring in Philadelphia firefighters, police officers and members of the Air and Army National Guard to compete in a hoagie-building contest for charity. Check out the full list of Wawa Welcome America events here.